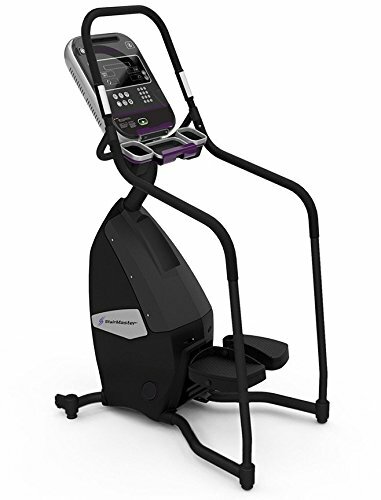 The Series 8 Freeclimber StairClimber by Stairmaster is a commercial-rated step machine with independent step motion used to increase heart rate and endurance and burn body fat during cardio exercise. Featuring a wide range of programming options in a small footprint, the Free Climber stair climber (formerly called the SC5) is a powerful addition to your workout when used both as part of your circuit training programs or alone. Speed control buttons allow you to increase or decrease the intensity of stepping action at any time during your workout. And with a space-saving design that fits in just 2' x 4' of floor space, you can place this step machine in any room in your home. The smooth stepping action comes from the electronically controlled alternator with chain drive that precisely controls the pedal descent allowing a wide range of users to exercise smoothly within their comfort zones. The resulting step range of 26 to 174 steps per minute will strengthen your legs, boost your cardio, and challenge even the fittest of users. Independent pedal geometry with four-bar linkage keeps pedals level ensuring a safe, biomechanically correct movement. 10 programmed workouts include Quick Start, Manual, Fat Burner, Calorie Burner, Intervals, Bell-Shaped, Build, Mystery Challenge, Steady, and Heart Rate Zone Trainer. The console also offers a nationally recognized multi-stage fitness test that gauges your individual progress, along with a custom firefighter test (CPAT) that measures your cardiopulmonary endurance and muscular strength. Easy-to-read LCD console displays time, interval timer, level (1-20), heart rate, calories, floors climbed, floors per minute, watts, METs and workout profile. Console features: reading rack, dual water bottle holders, accessory tray, integrated service light, and personal fan. Warranty: 15 years Frame, 3 Years Parts, 1 Year Labor and Wear Items. Residential and Light-Commercial Application. LCD Console. Connectivity: Bluetooth, ANT+, USB Port. 10 programmed workouts plus Fitness Tests. Step rate 26 to 174 steps per minute. Step range 1" to 14". Independent pedal step motion. Input Voltage 100-240 VAC 50/60 Hz 100 VA. Electronically controlled alternator with chain drive. 20 training levels. Contact heart rate and telemetry HR monitoring (chest strap not included). Assembled dimensions: 43" L x 27" W x 68" H. Unit weight: 155 lbs. Max User Weight Capacity 350 lbs. If you have any questions about this product by Ironcompany.com, contact us by completing and submitting the form below. If you are looking for a specif part number, please include it with your message.